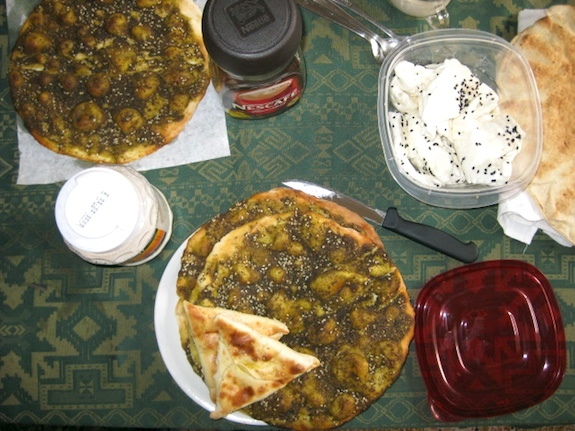 Posted in entrees, Middle Eastern, recipe, savory by Antonio Tahhan on March 6th, 2010. You can follow any responses to this entry through the RSS 2.0 feed. You can leave a response, or trackback from your own site. These look quite exquisite. 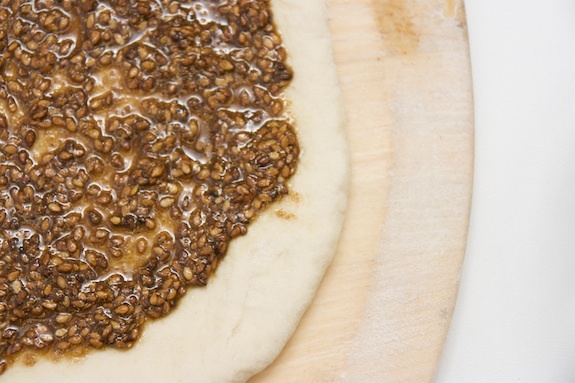 I don’t know why I always want something red on my pizza, but za’atar *and* spicy red pepper paste sound phenomenal. 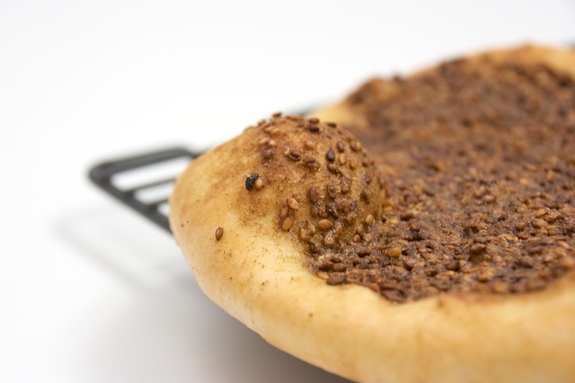 I’ve just recently discovered za’atar and I love it. This looks lunch for me today! @KJ are you serious? Now, I want to learn how to roast my own! Does your aunt have a recipe or general steps for roasting her own za3tar?? I LOVE manaqeesh! I can’t think of anything better to start the day! I noticed your zaatar was reddish in hue, mine is more on the dark green side. Is it the photo or do they put somthing in Aleppo like more sumac or some red pepper? I am curious! I bought three bags of zaatar in addition to the one I brought back from Lebanon homemade, and none of them have this color. Looks delicious. I’ve never had this dish or anything quite like it – but yum! Wow! That is amazing!First time to your site and I’m loving it!This is one amazing pizza! You don’t have to proof this dough? I’ve just discovered this post and it’s answered a question that’s been plaguing me! I live in Sydney in Australia and have recently moved into a suburb with a large number of Assyrian Iraqis (as well as large numbers people from Laos, Iran, the Balkans and South America – I think we’re the most multicultural suburb in Sydney now). There’s a bakery that makes good manaqeesh so I have one for breakfast some Saturdays with a glass of ayran. 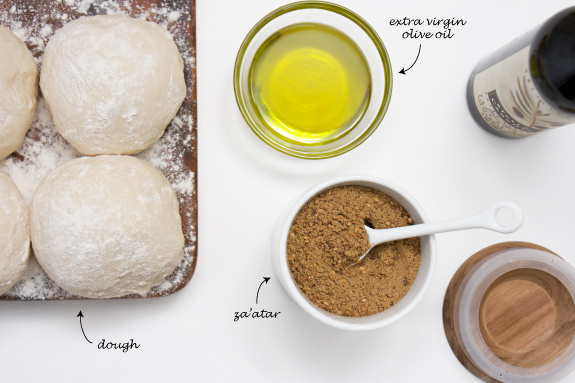 At home I’ve been sprinkling some zaatar over all sorts of things. 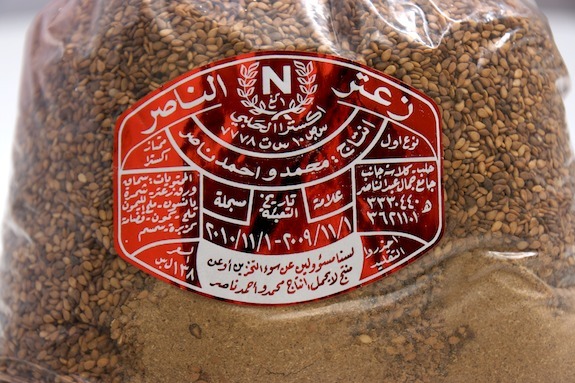 I’d gone through a bag of ‘green zaatar’ (thyme, sumac and sesame seeds) which was imported from Lebanon and so I bought a bag of the ‘red zaatar’ which tastes quite different – my Assyrian friend told me it was more of a Syrian-style zaatar and had spices in it. I could work out most of them but there’s one taste I couldn’t till now: the roasted garbanzo beans (or chickpeas as we call them here). Thanks for clearing up what this mystery taste is! Incidentally (and probably heretically!) 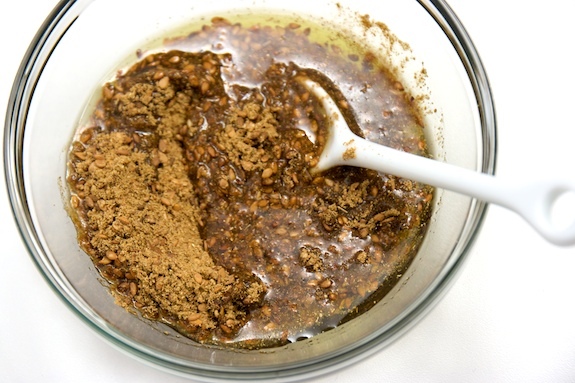 zaatar of either sort is fabulous over hot popcorn – about two heaped teaspoons over a big bowl of still-hot popcorn is fabulous. @Robert: Glad I could help solve the mystery 😀 Oh and I sprinkle zaatar on stove-top popcorn all the time. It gives it a nice tangy zing.